Today the sun came out, and I am thankful... 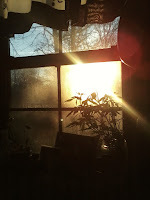 I Stood there for a while this morning, just basking in the sunshine shining in my kitchen window, soaking it up and thanking the Lord for the break in the rain, even if just for a day, a few hours, as it is already raining again. And I have not managed very well at all to stay on top of things on the blog as I would have liked. I am running so far behind on my reviews it is embarrassing. Not as much on the ones that have specific deadlines, but those that don't seem to end up on the back burner of all the other things that became the urgent. It seemed like sickness has hounded our house since round about Christmas, and I am just waiting for spring, new beginnings, fresh air, and sunshine. To top it off we have had the flu and whatever other bugs are going around the past couple weeks and I feel like I am just running a race I cannot catch up on. But there is also much to be thankful for. The flu could have been a whole lot worse, and we are still so very blessed. So I cannot complain. I simply want to offer an apology for falling off the wagon for a while. Bear with me... I am sure things will improve sometime soon! Hopefully I will be able to get a few reviews done this week and begin getting back on track. Thank you for your patience either as an author, publisher, promoter, or reader.